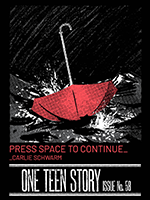 TRY ONE TEEN STORY — RISK FREE! To start reading One Teen Story, fill out the form below, and we’ll add you to our list of print subscribers. We’ll get your first issue in the mail, and will send you a bill for $15.00 for a full year (4 issues). If, after receiving your first two issues, you decide you don’t want to continue receiving One Teen Story, let us know and we’ll cancel your subscription, no questions asked. Print subscriptions take up to 4-6 weeks until the first issue arrives. Pay by credit card and get a FREE Bonus Issue: If you’re sure One Teen Story is for you, use your credit card to pay online. We’ll extend your subscription by one issue as our way of saying thanks! Click here for international rates and here to subscribe on your Amazon Kindle. Issues will be mailed via air mail. Payment in USA funds must be received before we mail an issue. Holiday gift subscriptions will start with issue #0 which mails in early January. Recipients will be notified of your gift according your delivery option. Member Discount: In order to qualify for our member discount, you must be a member at the time of registration. Please note that the discount is for our members only. Members commit to annual donations and receive benefits that allow them to participate in the organization in more meaningful ways. Not all One Story subscribers are members. If you’d like to find out more about becoming a member, you can do so here.